zzz probably has posted a few posts earlier about Paris. Europe is just so fairytale like in so many ways. The streets (even the streetlights are quaint! ), buildings that breathed the air of history, never ending museums to will the day away, the parks, the culture, the FOOD and the scenery. Every time we stepped into Europe its almost like stepping into another timezone. Not that the people wear medieval fashions, but everything works in a slightly differently clockwork that we urbanites tend to watch and soak it all in awe. Well, as you probably can see, we kind of miss the holiday (who doesn’t for a holiday), and the most wonderful foods we had. 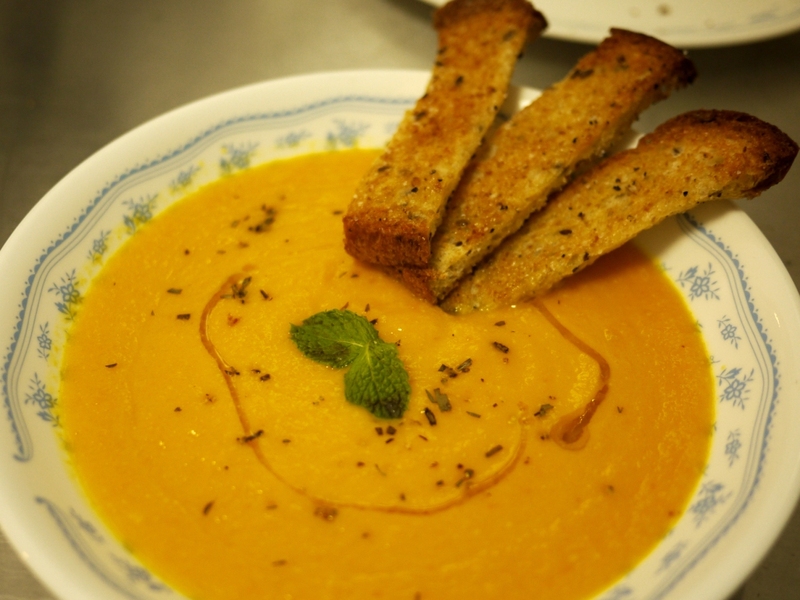 Like the carrot and the parsnip soup we had in this small cafe called Causes which serves almost everything (or maybe it is everything) organic, it even has this nice little grocery shop besides the restaurant. 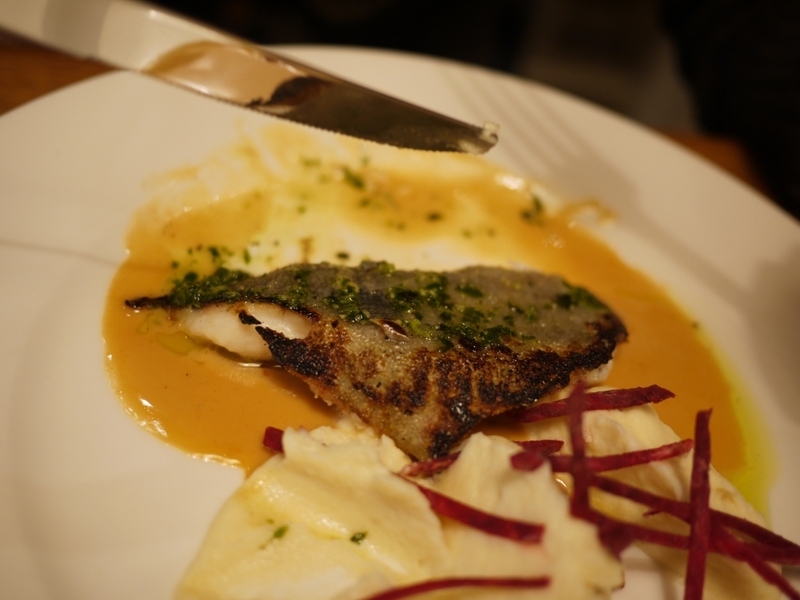 The whole grilled sea bass (perfectly filleted) and cod fish we had at Vin & Maree (their fish is quite different in texture, with a firmer flesh i would say) and the yummy lemon tart to end of our meal there. The fulfilling crepes at Creperie de Josselin with homemade caramel sauce which combines to a wonderful mush to melt in your mouth. There were so many, simply looking at the photos will make one salivate. Anyways, since we are back home and 13 hours away from Paris, the closest we could do to curb that craving is for zzz to whip up a Paris inspired dinner, just so to get a tinge of Paris in the fastest way possible. Heat a heavy bottom pot. Add olive oil and saute shallots, garlic and ginger. Add carrots and 750 ml of stock. Cook for 30 mins or until carrots are soft and tender. Blend until smooth. Add coconut cream. Taste and season lightly. Add remaining stock if necessary, adjusting to the desired consistency. Garnish with mint leaf, olive oil and mixed herbs/spices (i used black pepper, fleur de sel, dried oregano and cinnamon). Preheat oven to 240 deg celcius. Make a marinate of olive oil, lemon juice, salt and pepper. Marinate whole sea-bass. Change the oven setting to grill (top heating element only). 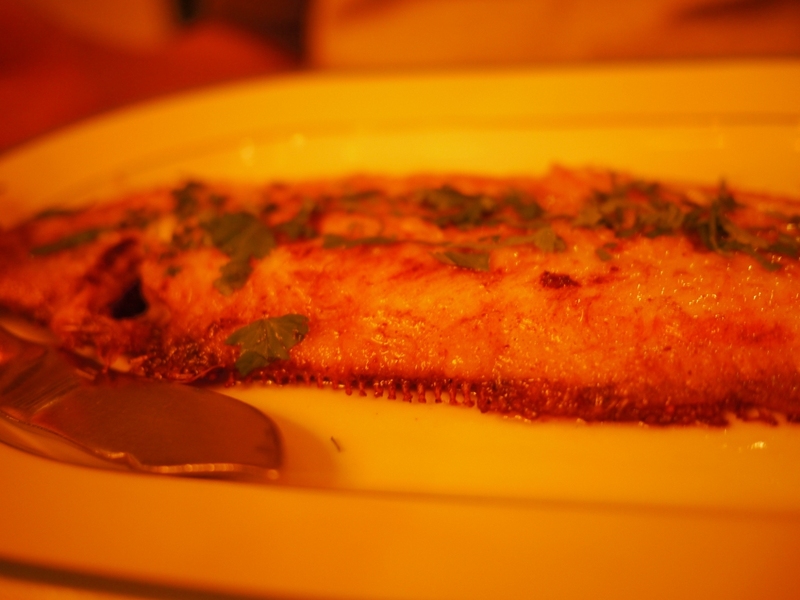 Put the sea bass into the oven (i set it on a wire rack with a pan at the bottom to catch the dripping juices). Depending on size of the sea bass, grill for 20-40 mins, turning halfway. Once the skin is crisp, the fish should be cooked. 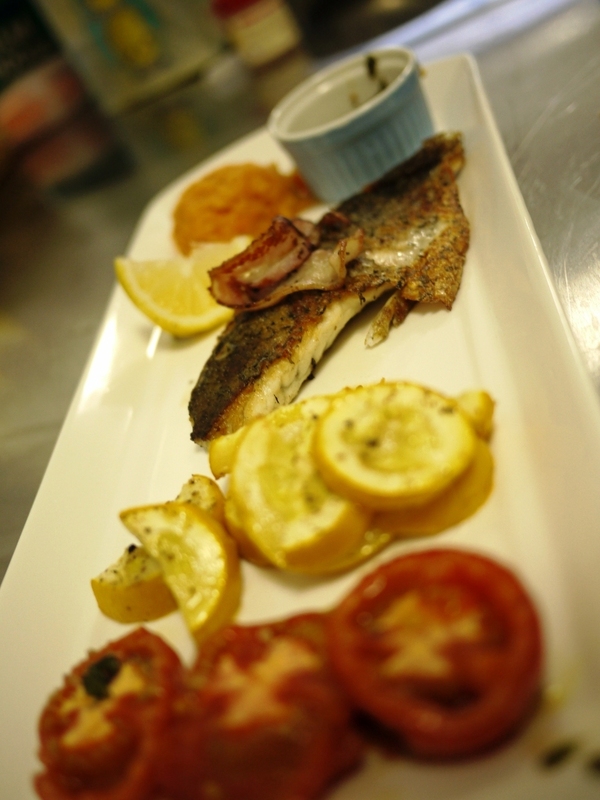 If the skin refuses to crisp after the fish is cooked, so be it.. it’ll still be tasty!! Place all ingredients in a food processor and blend till crumbly. Turn out into a bowl and work quickly with fingertips into a dough. Do not overwork. Press into tart tins. (Should be enough for 3-6 medium-small tins). Cover with cling film and rest in fridge for at least an hour, more if you can afford. This tart needs a fully baked crust. Preheat the oven at 190 deg celcius. Line the face of the tart dough with Al foil and weigh it down with beans or pie weights. Blind bake in oven for 15 -20 mins. Remove the foil and beans/weights. Bake uncovered for another 8 to 10 minutes or until the crust is nice and slightly brown. Remove and cool. Whisk eggs, lemon juice and sugar in a bowl. Place the bowl over a pot of simmering water and double boil for ~30 mins, whisking periodically, until the curd changes consistency. Continue whisking and heating on the double boiler for a minute and remove from heat. add butter and whisk in until it disappears. Leave aside to cool to room temperature. Curd will continue to thicken as it cools. Pour the curd over the tart and chill. Garnish with mint leaves and/or fresh fruits if desired. 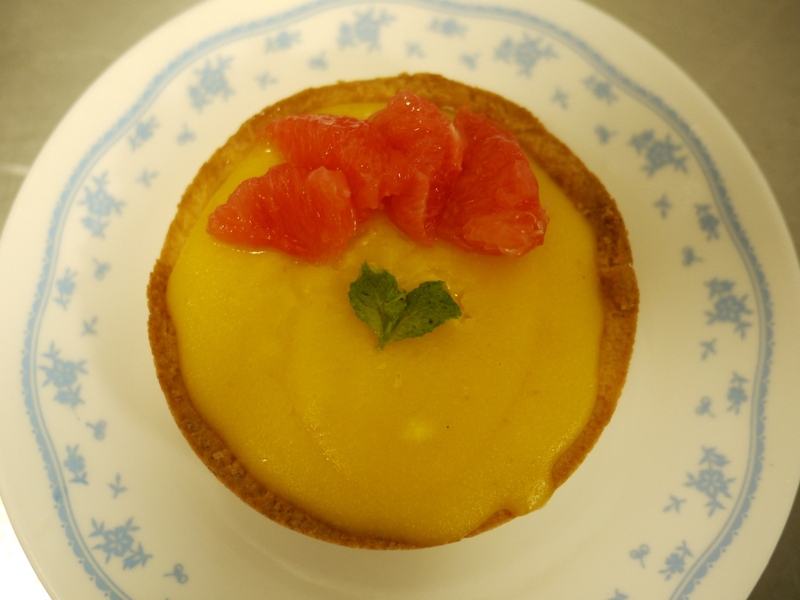 This entry was posted in Bake, Cook, Travels and tagged fish, grilled, lemon tart, Paris, seabass, soup, tart on March 24, 2012 by three3seconds. 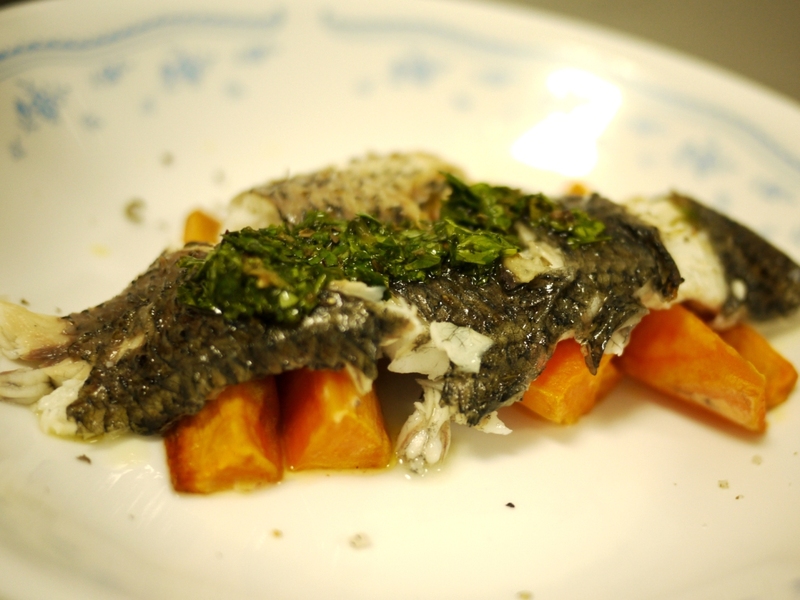 zzz decided to give his take on a pan-seared kim bak lor (our local sea-bass!). Secret to a fillet with crispy skin and succulent flesh: Lay fish skin-side down on hot oiled pan and DO NOT DISTURB for a few minutes. Fish will naturally release off the pan and not stick when the skin crisp up. Flip over and turn off the heat to finish cooking the flesh side. 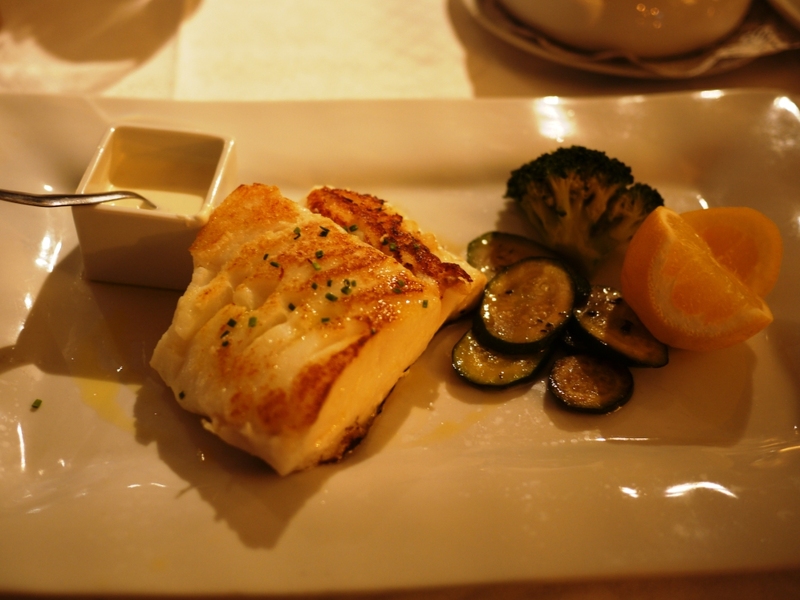 This entry was posted in Cook and tagged sea bass on March 9, 2012 by three3seconds. Put all ingredients in a food processor and blend into a paste. Transfer into a bowl and top with olive oil. 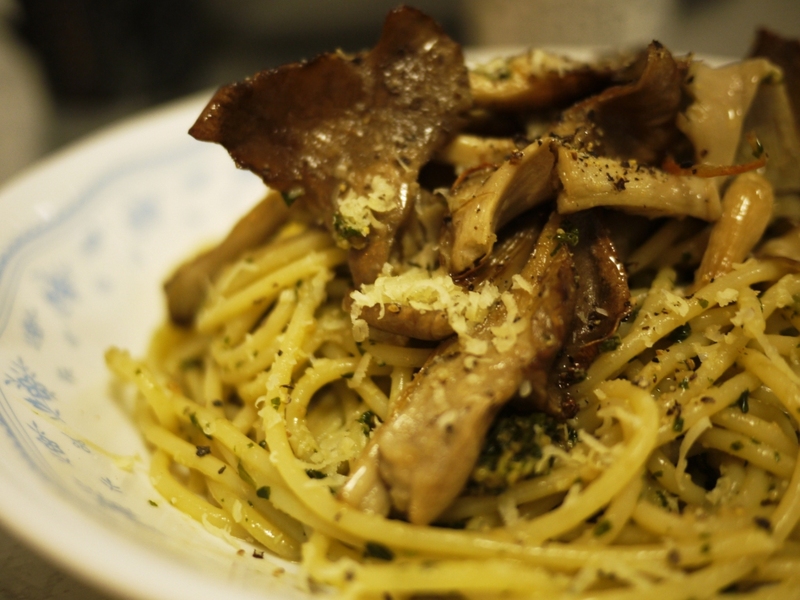 This entry was posted in Cook and tagged mushroom, pasta, pesto on March 9, 2012 by three3seconds.